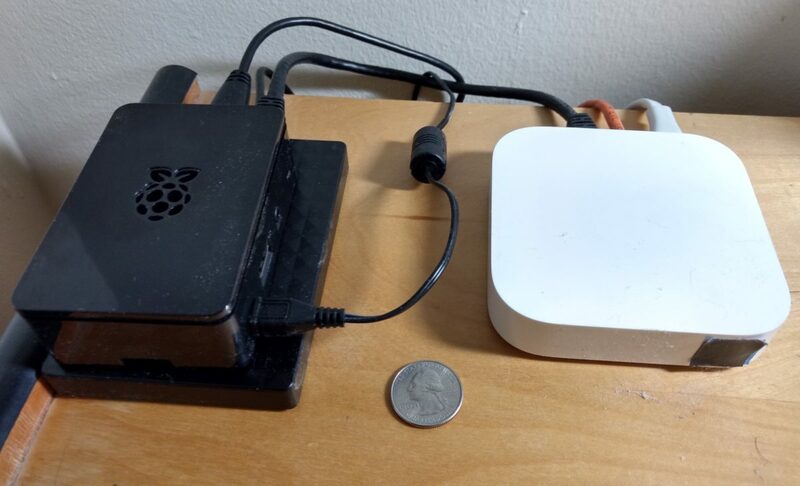 A year and a half ago, my brother gave me a Raspberry Pi 3 as a birthday present, suggesting that I should use it to run my own server. I used to run my own server. A friend who liked to build such things had built it. It had two ethernet ports, one connected to my cable modem and the other connected to my WiFi router, and it was running OpenBSD (then the most secure OS easily available) and was configured to serve as a firewall. It didn’t require much upkeep, but it required more than none—which turned out to be more than I wanted to devote to it. At some point a serious security flaw was discovered in the OpenBSD release I was running. By then most desktop machines had built-in firewalls as did most routers, and I had Time Machine as a backup solution. It seemed safe to give up my server, and easier than updating it. In the years since then, the use of cloud services has become ubiquitous, to the point that practically everything I do ends up in the cloud—my photos go to both Flickr and Google. I also use Dropbox (where I have Scrivener stash a backup copy of everything I’m writing) and I stash some amount of my music at both Google and at Amazon. That’s all great—those services are well backed-up, and the servers are very likely running the latest security patches—but I really like the idea of having my own data on my own machines. But I want that without giving up the advantages of having my data in the cloud. Hence wanting to have my own server. All that as prequel to my brother coming to visit this past week, and helping me get my Raspberry Pi server up and running. Once the basic install of Raspbian was up and running, I went ahead and ordered a bit of hardware for it. I got a short ethernet cable to connect it to my router, so that it doesn’t have to do WiFi for basic connectivity (although WiFi and Bluetooth are built in). I also got a slightly more powerful USB power supply for it, mainly because I also got a portable USB hard drive that takes its power from the USB port, meaning that the power needs to be available to the Raspberry Pi. Finally, I got a case for it, so that I don’t just have a naked circuit board sitting on my dresser. This time the hard drive is 1 TB rather than 40 GB. I’m still sorting out my sharing strategy. I don’t want to share my whole Music folder with my phone, because it would use all the space there. (I’ll probably end up making a folder with an “essential subset” of my music to share with the phone.) I don’t think I want to share my whole Documents folder on my desktop machine, but I’m not sure yet. For the time being I’m sharing a folder I call “Active writing” with the files I’m currently working on, on the desktop, the server, and my laptop. That way they’ll be available wherever I want to work on them. Other things are tougher. I’d like to have my own calendar server, but that doesn’t seem easy. I should go back to my post on the google-free option and see what else I was thinking about that I might now be able to implement. For now, though, I’m pretty happy. My previous server was rack mount width and maybe four or five inches tall, about the size of a stereo component. This one is maybe 3 inches by 5 inches, rather smaller than the hard drive it’s sitting on. Over a period of some months I’ve been working to clean up the set of feeds I try to follow. Today I got the unread count down to zero, perhaps for the first time since I started using a feed reader. Certainly for the first time in years. The first permanently reduces the burden of stuff I imagine that I ought to do. The second just briefly hides the fact that there are some feeds I imagine I want to follow, but that I don’t actually keep up with. Still, I figure this is a test of sorts. Some of those feeds were pretty quiet. Maybe, if they’re not mixed in with all the stuff I’m not keeping up with, they’ll be easy to follow. And, if they’re not, I can always unsubscribe later. This flurry of feed-pruning activity brought to you by procrastinating on the novel. I’m in the midst of some tough slogging as I push through the final third. Even after my previous pass through this bit, it is still written a lot like a short story. The scenes are highly compressed, with lots of bits merely referred to. As I reach those scenes, it takes me a while to uncompress them—to see the two or three or four scenes represented by the existing text, and then to compose those scenes, placing them in the right sequence in the story. In any event, progress continues. It’s just hard. As I go to click the “publish” button on this post, my unread feed count stands at zero. I had earlier tried using tt-rss, which also isn’t quite there yet, but has a different set of issues. It requires a server. Steve had tried to cobble together an instance that ran on the server where we host our websites. It had just almost worked, but kept bumping up into the limits of running as a cron job, rather than a daemon. It eventually had several bad days in a row (which we later traced to an unrelated heavy load on the server), and we gave up. Now Steve has installed an actual server machine in his house, and is running a tt-rss instance there, and has made me an account on it. Running on an (essentially) dedicated server with a (reasonably) high-speed connection to the internet, it’s now doing a fine job of keeping all my feeds up to date. I’m having some minor user interface issues, but nothing that would keep me from using it as my rss reader for the foreseeable future. So, I have officially switched over. You can follow the interesting stuff I share via a feed from that site, and have updated the “interesting stuff” item in my sidebar to draw from that feed. Zen Habits has a fresh post up on becoming Google-free. It’s a pretty good look at the key resources that Google provides—Gmail, Google Docs, Google Reader, Google Calendar, Picasa, etc.—and for each one provides Leo’s choice for a replacement, along with mentioning a few other alternatives. On the one hand, this is just the sort of thing I’m a bit too prone to worry about. For me, security, privacy, and reliability are right up there with functionality. On the other hand, it had scarcely crossed my mind that I’m so reliant on Google that becoming Google-free was an important issue. So, seeing Leo’s article prompted me to give it some thought. To me, the more fundamental issue is choosing to keep your data on your own hardware or to keep it in the cloud. It used to be that the cloud was a loser on all four issues (security, privacy, reliability, functionality). In just the past few years, the cloud has made great strides in the latter two. I haven’t seen a careful analysis, but my sense now is that the cloud is about as reliable as your own hardware, albeit with different failure modes (less chance of a bad disk drive losing a bunch of data, more chance of the provider deprecating the tool or simply going bust). Functionality is a different kind of question—all you care about is whether the tool provides the functionality you need—but my sense again is that tools like Google Docs do fine at providing the most important functionality. On issues of security and privacy, though, it seems to me that the cloud can never win. Well, maybe in one narrow sense: Servers in the cloud can be professionally managed with security in mind, so there’s a better chance that security patches will be applied promptly and less chance that they’ll be configured in an insecure way out of carelessness or ignorance. Except for that, though, all the cloud can offer is an unenforceable promise of security and privacy—and it rarely offers even that. Because of that, I’ve always ended up choosing to keep mission-critical work on my own hardware. I use various cloud services, but they’re all in some way either publishing or else secondary. Where what I’m doing is publishing (such as this blog, my account on Flickr, my account on Twitter, and so on), the privacy issues are moot—I’m explicitly making the stuff public. I still care about security, but my security interests are closely aligned with the provider’s security interests, so I feel reasonably comfortable relying on the provider to get security right. All my uses of cloud-provided tools are non-critical. I have a Gmail account, but it’s a backup account for use when my main email account is unavailable for some reason. I have a Google Docs account, but I only use it occasionally to view a Word document or make a graph with the spreadsheet facility. I don’t use Google Calendar (I use iCal). The one Google tool that I’d really miss if it disappeared is Google Reader which I use every day, but even losing that wouldn’t be a catastrophe. I could go back to reading blogs on the websites themselves (!) until I picked out a new RSS feed reader. My latest backup of my subscriptions was really old (I just now grabbed a current one), but I’d be able to recreate the important ones easily enough. The upshot is that going Google-free seems to be a non-issue to me. I could do it in five minutes and scarcely feel the loss. I’m glad to have been prompted to think about it, though.